An event for non-Catholic young adults from the ages of 20 to 35. 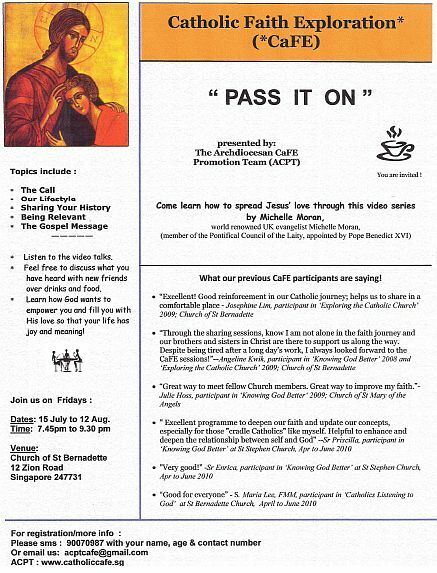 Catholics are most welcome to come along with their invited non-Catholic friends for an afternoon to discover more of what life has to offer us. Tea and snacks will be provided. The church of St Anthony is pleased to host a Golf Tournament as a Fund-Raising for the new Annex Building. Includes green and buggy fees, tee-off with Guest-of-honour Dr Tan Cheng Bock, lunch, dinner and goodie bags for 1 flight of 3 golfers as well as logo endorsement at all events backdrop (for company registration only). Includes green and buggy fees, Novelties Game x 1, lunch, dinner and goodie bags for 1 flight of 4 golfers as well as logo endorsements at all events backdrop (for company registration only). Time 11.30 a.m. – 9.00 p.m.
Booking must come in by end March 2012. VATICAN CITY, October 16 (CNA/EWTN News) – Pope Benedict XVI has declared a “Year of Faith” which will begin in October 2012, the 50th anniversary of the opening of the Second Vatican Council. “It will be a moment of grace and commitment to a more complete conversion to God, to strengthen our faith in Him and proclaim Him with joy to the people of our time,” said the Pope, making his announcement during Sunday Mass at St. Peter’s Basilica. The Year of Faith will run from October 11, 2012, until November 24, 2013, which is the Solemnity of Christ the King. The vast congregation at this morning’s Mass largely consisted of those involved in the “new evangelization,” who were in Rome for a summit organized by the recently formed Pontifical Council for Promotion of the New Evangelization The new evangelization aims to revivify Catholicism in traditionally Christian countries which have been particularly affected by secularization in recent decades. Drawing upon the Scripture readings for today, the Pope outlined a roadmap for the new evangelizers. In the first reading, the Prophet Isaiah recounts how King Cyrus, the Persian Emperor in the 6th century B.C., played his part in fulfilling a divine plan despite that fact that he “did not know” God and was not even Jewish. “Even the mighty Cyrus, the Persian Emperor, is part of a greater plan, that only God knows and carries forward,” observed the Pope. This demonstrates, he said, the need for a new “theology of history” as an “essential part” of the new evangelization “because “the men of our time, after the disastrous season of totalitarian empires of the 20th century, need to find a comprehensive vision of the world and time,” more compatible with the vision of the Church. The fact that it is God and not the evangelist who touches hearts, shows the importance of recognizing God as the prime mover in any apostolic activities which “must always be preceded, accompanied and followed by prayer,” he said. Pope Benedict also highlighted the importance of having collaborators like St. Paul who had Silvanus and Timothy as his companions in his work, and said today’s new evangelizers should also seek coworkers in spreading the Gospel. He then turned today’s Gospel and said that it provides the key message the new evangelizers must bring to the world. In it, Christ tells the Pharisees to “render therefore to Caesar the things that are Caesar’s, and to God the things that are God’s.” This is a reminder that the Church’s message is not primarily a political one, the Pope said. God has opened the doors for the Four Steps Retreat and the Quiet Time with God Retreat to return to Singapore yet again. The two retreats will be held in November as part of the Parish Revival Program of Our Lady of Lourdes. Even though it’s main focus is parish revival, the Parish Priest Rev. Fr. Augustine Joseph has extended the invitation to all who are interested. We would be grateful if you could help pass the word around, to at least five people you know. If you have to, bring them along for the retreat with you and I am sure God will bless you abundantly for it. You can also send us the names of the people you are planning to invite so that we can start praying for them. Time: 2:00pm – 9:30pm (Dinner provided). Intercessory Prayer; We have organised an intercessory prayer campaign, who is coordinated by Sis Phyllis Cheong, she will send you a separate e-mail with the details. o At Our Lady of Lourdes after every mass on the 22nd, 23rd, 29th and 30th October. If you are available to join us distribute them, please e-mail me the dates and times you would be available. Recorded via Iphone 3gs during one of the worship songs. The next praise and worship session is next Wednesday 8pm at St Thomas Aquinas Room Church Of St Anthony Singapore. A Talk will be given by Bro. Martin from Church of Our Lady Of Lourdes. There will be a Eucharistic celebration and healing service on 6th of August, Saturday at the St. Anthony’s Auditorium at 7.15pm. Preacher Fr. Gerard Weerakoon. Come and receive God’s love and mercy. There will be potluck and fellowship after the event. All are welcome. I have personally attended quite a few healing services and have witnessed that through His grace, love & by the healing powers of Jesus that all who have attended, had been touch in some way or another. Come and experience Jesus, His love and mercy!